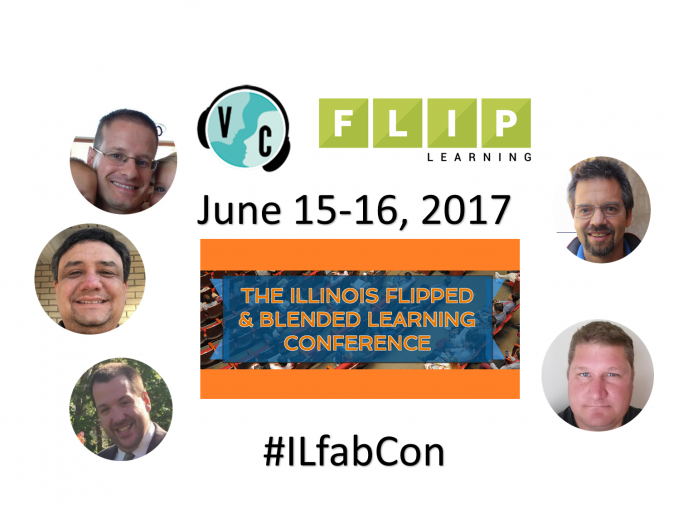 In collaboration with The Flipped Learning Network, we’ll be VConnecting from #ILfabCon in Huntley, IL, U.S.A. This is the Illinois Flipped and Blended Learning Network conference running on June 15 and 16th. We will be connecting with the event organizers for two sessions. All times listed are Central Daylight Time but the widget will translate to the local time that your web browser reports. We invite you to participate live (bring your webcam, microphone, and headphones/earbuds)! To do so, contact us via a comment on this post of your can direct message Ken Bauer on Twitter. We join Kevin Hogendorp and Gerry Marchand, the co-founders of the Illinois Flipped and Blended Learning Network to talk about the first day of the conference. Onsite buddies will be Matthew Moore and David Walsh while Ken Bauer will be your virtual buddy for this session. Guests still to be determined for the lunchtime session. Onsite buddies will be Matthew Moore and David Walsh while Ken Bauer will be your virtual buddy for this session.